I posted this for the first time on November 11, 2008. It’s still relevant, and (I suspect) always will be. On October 9, 1918, an HMV sound engineer named Will Gaisberg set up a primitive piece of recording equipment immediately behind a unit of the Royal Garrison Artillery stationed outside Lille and recorded a British gas-shell bombardment. His purpose in doing so was to preserve the sounds of war before the coming armistice caused them to vanish forever from the face of the earth. the actual reproduction of the screaming and whistling of the shells previous to the entry of the British troops into Lille. It is not an imitation but was recorded on the battlefront. The report of the guns and the whistling of the shells is the actual sound of the Royal Garrison Artillery in action on October 9th, 1918. No book or picture can ever visualise the reality of modern warfare just the way this record has done…it would require only the slightest imagination for one, by means of this record, to be projected into the past, and feel that he is really present on the battlefield witnessing this historic chapter of the war. Gradually we came within the sound of the guns, and eventually, when only a short distance from Lille, we pulled up at a row of ruined cottages, in one of which the heavy siege battery had made its quarters. In the wrecked kitchen we unpacked our recording machines and made our preparations before getting directly behind a battery of great 4.5′ guns and 6′ howitzers, camouflaged until they looked at close quarters like giant insects. Here the machine could well catch the finer sounds of the “singing,” the “whine,” and the “scream” of the shells, as well as the terrific reports when they left the guns. Dusk fell, and we were obliged, very reluctantly, to pack up our recording instrument and return to Boulogne–and to England; but we brought with us a true representation of the bombardment, which will have a unique place in the history of the Great War. This recording is one of the most haunting and disturbing documents of the past that I know—one made all the more haunting by the knowledge that Will Gaisberg accidentally inhaled some of the gas from the attack, which damaged his lungs irreparably. In London he fell victim to the international flu epidemic that was then ravaging the city, and died on November 5, just six days before World War I came to an end. 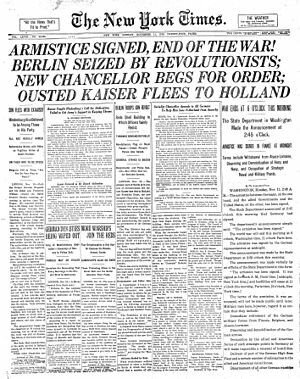 A century later, I can’t help but wonder how many Americans now understand the original meaning of what used once upon a time to be called Armistice Day. “This is either an indictment of the American public school system or my own curiosity and comprehension, but I still can’t summarize what World War I was fought for,” a well-educated friend of mine tweeted over the weekend. What seems sadly clear, though, is that our collective awareness of that unimaginably terrible conflict is fading fast, perhaps in part because no one who served in what Woodrow Wilson called “the War to End War” is still alive. Frank Buckles, the last American veteran of World War I, died in 2011, at the age of 110. If you think of Frank Buckles and his comrades today—and you should—take a moment to think about Will Gaisberg as well. UPDATE: Is this recording completely authentic? Read more about it here.